Sunflowers. The Yellow House. The red-bearded, scowling artist. These images have become shorthand for Vincent Van Gogh. But, however memorable, they are only part of a much bigger picture. For, as a new RA exhibition demonstrates, Van Gogh was a man of supple intellectual sophistication, style, and subject. From landscapes to drawings to portraits, he was so passionate about his self-imposed work, that, in a career of only 10 years (until his suicide at 37), he made almost 900 paintings. Of these, many are documented, often by wonderfully faithful ink studies, in 902 surviving letters. Most of these were written by Van Gogh to his younger brother Theo, as a daily record of what he was working on. In the show, 35 illustrated letters, done with a reed pen in black ink faded to a lovely brown, sit by the paintings they describe. Together, they tell the story of the artist’s developing genius, and the relationship between him and his brother. 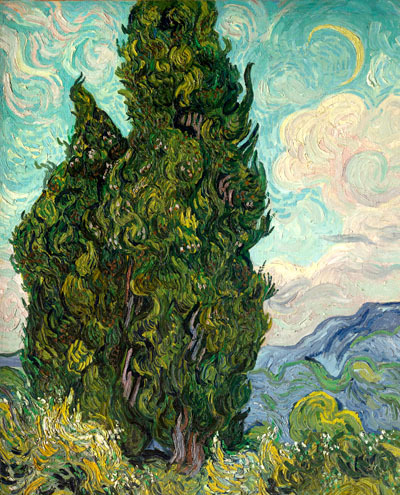 Throughout Van Gogh’s life, Theo not only supported him, but repeatedly ran to Parisian art shops to send him endless tubes of paint zinc white, Prussian blue, Veronese green. Vincent could not have survived without Theo. But Theo also provided the sounding board on which Van Gogh explored his thoughts about art. Through this written crystallisation of ideas, Van Gogh made faster artistic headway than by painting alone. Looking at a painting and reading the accompanying letter, it feels as if the artist is explaining things directly to you. Ranging from literature, or detailed descriptions of colour combinations, to humdrum accounts of meals, the letters prove that Van Gogh was not, in any conventional sense, mad; they also show that he was equally talented as a writer and painter. For him, all forms of expression fused. In letter 312, he wrote: ‘Books and reality and art are the same kind of thing for me.’ He preferred painters and writers who went straight to the essence of a subject Charles Dickens and Emile Zola, Eugène Delacroix and Paul Gauguin artists whose creations sprang alive from the page or picture with the same vivid zest that his own subjects leap from the canvas. Like those men, Van Gogh wanted to enhance the lives of ordinary people. and the magnificent portrait of L’Arlésienne, and one of his last works, Portrait of a Peasant Girl in a Straw Hat. In this, the girl sits among high golden wheat studded with poppies, whose same clear red blooms in her cheeks. Van Gogh’s bubbling excitement over this cohesive, organic portrait, expressed to his sister Wilhemien in a letter-sketch, gives no hint of the tragedy to come.